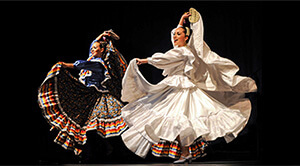 This show has been labeled as a cultural treasure because of the traditional dance, Mexican music and flamboyant costumes. In 1985 Ballet Folklorico “Quetzalli” de Veracruz was founded by Maestro Hugo Betancourt and call home Xalapa, the capital of the Eastern Mexico gulf state of Veracruz. This group has toured internationally in more than 20 different countries performing this traditional dance along with “Carnaval Veracruzano,” an Afro-Caribbean dance. The company has been the official representative for the Secretary of Tourism and Economic Development for the State of Veracruz since 1986. The history of the Mexican dance began in ancient cultures during the 3000 years before the arrival of the first Europeans. Shaman, musicians, acrobats and dancers with highly refined representations have been found dating back to as early as 1500 B.C. across Mexico. The Spanish arrived in 1500 A.D. and implemented their own culture into Mexico, which added new elements. Each region in Mexico has its own unique dances corresponding with the physical climate and cultural traditions. Such as with Veracruz, another element can be seen, the influence of African rhythms. This was added into the dances during the colonial times when slaves worked the sugar cane. See for yourself if this dance is as colorful, flamboyant and a cultural treasure like they are saying.